For the past year, there's been a concerted push within the U.S. government to ban frank talk about the nature of the Islamist enemy. It began with the Department of Homeland Security, then moved to the National Counter Terrorism Center and the departments of State and Defense. Already in May 2008, I heard an excellent analysis of the enemy by Deputy Assistant Secretary of Defense Thomas Mahnken in which he bizarrely never once mentioned Islam or jihad. I've been wondering how this change in vocabulary actually occurs: is it a spontaneous mood shift, a group decision, or a directive from on high? Jennifer Janin, head of the Urdu service at the Voice of America. Islamic terrorists: DO NOT USE. Instead use simply: terrorist. Islamic Fundamentalism/ Muslim Fundamentalists: AVOID. Muslim Extremists: NOT NECESSARY. Extremist serves well. Urdu is a dialect of Hindustani written in Arabic script found mainly in Pakistan and India and spoken almost exclusively by Muslims; it is mother tongue to about 70 million people. One can understand why euphemisms appeal in so far as VOA competes for market share with other news outlets and wishes not to insult or alienate Muslims. But VOA is not a commercial station with a bottom line and shareholders. Founded in 1942 as part of the Office of War Information, it is funded by the American taxpayer and speaks on behalf of the U.S. government. It must not pander to increase its ratings at the expense of its integrity. Urdu-speakers need to know the real American discourse on Islam, not Janin's bowdlerized version. In her defense, Janin might argue that she is merely picking up on Barack Obama's emphasis on "respect" for Muslims, but there is no public indication that "respect" means pretending that Islam is not a central public issue facing Americans. Indeed, on occasion, Obama has been very clear that it is. A pungent example came one year ago in Philadelphia, on March 18, 2008 when, in the course of a major speech, Obama repudiated as "profoundly distorted" the "view that sees the conflicts in the Middle East as rooted primarily in the actions of stalwart allies like Israel, instead of emanating from the perverse and hateful ideologies of radical Islam." "Perverse and hateful ideologies of radical Islam"? It does not get much stronger than that. One wonders how might Janin's new regimen translate this – probably as the "perverse and hateful ideologies of radical extremism," which is both inaccurate and unworthy of a credible news service. 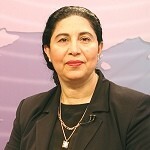 Spozhmai Maiwandi, director of VOA's South Asia Division. (1) Janin, sadly, is hardly alone at VOA in coddling radical Islam. For another case, look no further than Spozhmai Maiwandi, copied by name on Janin's memo. Nicknamed "Kandahar Rose," Maiwandi is the director of VOA's South Asia Division and acquired some notoriety for filing pro-Taliban reports and conducting an interview sympathetic to Mullah Omar, the Taliban chief, ten days after 9/11. (2) This latest directive from VOA fits a pattern of U.S. government-funded programming to the Middle East posing problems. Two earlier cases that come to mind: a 1991 scandal concerning the pro-Saddam tilt of VOA's reports from Baghdad and the 2007 resignation of Larry Register from Al-Hurra television for promoting anti-American and anti-Israeli views. Could someone instruct the Voice of America staff, once and for all, that its mission is not to flatter its audience nor to pursue ratings for their own sake but honestly to convey American mainstream views to the outside world? (3) And while we're at it, could someone remind VOA employees that there's a lively debate in the United States about radical Islam; for a change, how about VOA covering this rather than smothering it under the Islamist line? In 2006, Meredith Buel of VOA robotically took a Council on American-Islamic Relations press release and rewrote it as a VOA news item; for the gory details, see my weblog entry, "Voice of America – CAIR's Shill." And the DHS document that started the whole euphemizing campaign, "Terminology to Define the Terrorists: Recommendations from American Muslims," relied on an unidentified "broad range of Muslim American community leaders and scholars" that has the hallmarks of CAIR & Co. Hey, VOA, repeat after me: "We work for the American people, we are not a subsidiary of CAIR." Mar. 6, 2009 update: A reply to this article from Joan Mower of the Voice of America can be found at http://www.danielpipes.org/comments/151787. My response to her includes more information about the Maiwandi interview with Mullah Omar. Related Topics: Dhimmitude, Media | Daniel Pipes receive the latest by email: subscribe to the free mef mailing list This text may be reposted or forwarded so long as it is presented as an integral whole with complete and accurate information provided about its author, date, place of publication, and original URL.